An affidavit of support is required as part of many applications for permanent residence based on marriage or other family relationships. It may also be required where family members of a permanent resident are coming to join the Permanent Resident in the United States. A sponsor in a family-based permanent residence case (and sponsors in some other cases) is required to file an affidavit of support in order to show that the person applying for permanent residence will not become a “public charge,” or dependent upon government services. The Immigration and Nationality Act of the United States requires a sponsoring family member or other individual to sign an affidavit of support to show that the applicant for permanent residents will not become a public charge. The affidavit means that the sponsor is financially responsible for the applicant for residence. 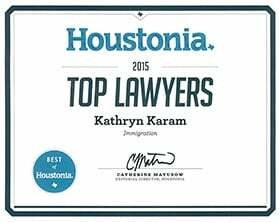 Kathryn Karam is a skilled Houston immigration lawyer who assists people with issues involving sponsoring family members to become permanent residents, including determining the sufficiency of an affidavit of support. Immigration regulations provide several basis to file the affidavit of support, including using current salary, assets, or other means. If U.S. Citizenship and Immigration Services or the U.S. Department of State determines that an affidavit of support is incomplete or the sponsor cannot show sufficient means to serve as a sponsor, delays in the processing of the case will likely result, and if the issues in the affidavit of support are not addressed, an application for permanent residence or an immigrant visa may be denied. Where there is concern that the affidavit of support will be deemed insufficient, Kathryn Karam can help you with this process. Call The Law Office of Kathryn N. Karam, P.C. at (832) 582-0620 to schedule a consultation. Kathryn Karam represents people throughout the Greater Houston area, including Clear Lake, League City, Pearland, Sugar Land, Katy, Cypress, Tomball and The Woodlands. A public charge is a person who is primarily dependent on the government for basic subsistence. A person will not be admitted as a permanent resident if it is determined that he or she is likely to become a public charge. Non-cash assistance programs like Medicaid for non-long-term issues, SCHIP, non-cash TANF assistance or food stamps do not lead to one being designated a public charge. If you are sponsoring a family member to become a permanent resident, it is necessary that you complete an affidavit of support. A Houston immigration lawyer can assist you in understanding the implications of the affidavit of support, and help with any other issues in family-sponsored immigration. Call The Law Office of Kathryn N. Karam, P.C. today at (832) 582-0620 to schedule a consultation.